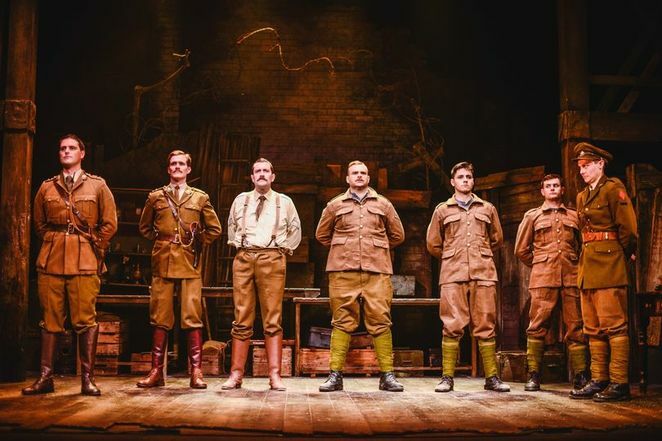 Ian Hislop and Nick Newman's comedy set on the front lines of the First World War was hugely successful on the West End and in previous tours and its current UK tour now takes in Birmingham Repertory Theatre. Based on a true story, it takes us into the trenches where the discovery of a printing press by a group of British soldiers leads to the launch of a newspaper. But The Wipers Times was no ordinary paper - written by serving soldiers it took a wry and humorous look at the war, poking fun at official news and officialdom as much as at the state enemy the German army. Named after the British soldiers' name for Ypres, The Wipers Times was published between 1916-1918 and was packed full of content by those at the front. It was this inspiring story which led Hislop and Newman to create what became an award-winning television film and a play. Having honed their skills on the satirical magazine Private Eye, Hislop and Newman are as sharp as a razor blade in the show's dialogue. We are left in no doubt of the buffoonery of the army in general as well as specific officers - not least the somewhat preposterous Lt Col Howfield played with bucket loads of irony by Sam Ducane. Determined to close The Wipers Times, Howfield sees the soldiers' comments as 'insubordination, if not treason'. There are some wonderful scenes between Howfield and the more cynical General Mitford (Dan Mersh) in which the General counters every argument of Howfield's with classic put-downs. When Howfield blusters 'war is not funny' Mitford bluntly tells him 'that is the point'. James Dutton is the naïve idealist Cptn Roberts who first conceives the plan for The Wipers Times. He is partnered with Lt Pearson (George Kemp) in leading the men into battle as well as leading the way in front-line print humour. Hislop and Newman don't shy away from the horrors of the war – with scenes from the Somme followed by General Mitford's reading of the list of casualties. But they also ensure the soldiers themselves are able to make jokes about these horrors. The writers were keen to ensure the words of the original soldiers formed part of the drama and so many of the sketches and jokes from The Wipers Times are recreated in a music hall format along with music and song. Directed by Caroline Leslie, the switching back and forth between reality and comedy sketch is easy to follow and engaging – as well as being hugely helped by Dora Schweitzer's set in which a 'stage' is created by a string of lights. The production is also helped by having a very strong cast who can play slapstick one moment and death-defying bravery the next. The tour couldn't be more timely as the nation prepares to mark the centenary of the end of the First World War in just a few weeks. The Wipers Times is a strong reminder that humour is often found in the darkest of places – and indeed it's often the humour which gives the hope.